Chaslyn Crespin is the daughter of Delbert and Torrivia Crespin and lives at Santo Domingo Pueblo. It is readily apparent from her work that she learned to do mosaic inlay work from her parents, particularly Delbert Crespin. 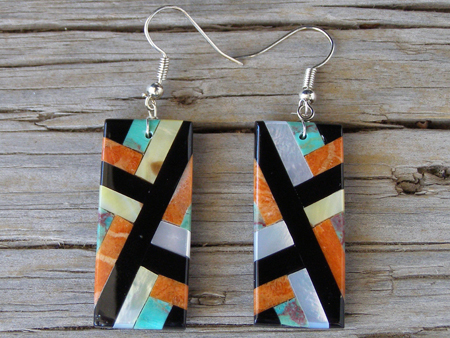 These mosaic inlay drop earrings are inlaid on a foundation of jet employing a variety of colors and materials in the mosaic tiles. The free-swinging drops are suspended from Sterling hooks. Dimensions of drops: 1 3/8" x 5/8"